Many of my blogging colleagues have been trendspotting for 2010 these past two weeks (see the list of posts at the end). I’m fashionably late, so instead of chiming in with a list, I’ll focus on one trend which is already getting some discussion: 2010 as the year of the client. So it really matters now what clients want: personalized help and guidance to arrange their legal affairs and to anticipate and minimize their legal troubles, from a trustworthy advisor who communicates frequently and is truly concerned with their best interests, delivered as quickly as possible at an affordable, predictable price. 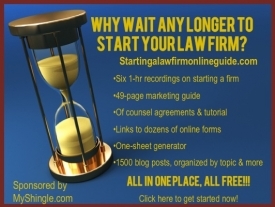 Other bloggers offered some suggestions how lawyers might respond to client needs. Lawyerist‘s Randall Ryder urges lawyers to focus on developing rapport with clients while Solo Practice University’s Susan Cartier Liebel advises lawyers to gear up to provide unbundled legal services for which there’s a growing demand in a down economy. Though I agree with this advice, much of the commentary on value billing and unbundled services suggests that these trends are gaining traction for economic reasons. But while the economy may have catalyzed the change in the attorney client relationship, there’s a more fundamental driver: the rise of the do-it yourself consumer. Consider the broader social trends, in addition to those I discussed here. Consumers are seeking information on health care options on line, with 60 percent acknowleging that online information changed their treatment decisions. Even if the economy bounces back, the DIY mentality that’s been unleashed by technology won’t go away. Over the next decade, clients will be asking more questions about options that they’ve read about on the Internet. Researching case law on Google and demanding lawyers make arguments based on precedent that they’ve discovered. Investigating potential opponents on social media (and not always lawfully). Perhaps even telling lawyers how to run their business – such as whether firms should give bonuses to associates. In many ways, client service will become an oxymoron. Because clients are not looking for service, at least as we lawyers have understood the term. Instead, clients want a partner – someone who brings expertise, who can explain issues and in short, can help them to help themselves. A partnership between lawyers and clients can be rewarding. Many of my clients are sophisticated engineers or scientists and I’ve won many a victory based on theories that they developed before they brought me on board. There’s a philosophical component involved as well: we lawyers need to reflect on what functions are “core” to our role as counselors. Just because clients demand a simple form or that we take a particular strategy doesn’t mean that it’s appropriate. At what point do we as lawyers surrender so much power to clients that we cease to function as an advisor? Or what of a situation where we sign a retainer agreement for unbundled services to draft a lease for a landlord who’s expressed intent to violate fair housing laws. Do we have an obligation to advise on that – or do we say that it’s outside the scope of the retainer? Indeed, in an age of lawyer-client parity, does our current ethics code make sense? Interesting questions all, but beyond the scope of this post. But let’s at least acknowledge one thing: DIY clients are here to stay. It’s not an economic phenomenon, it’s a sea change. Lawyers who fail to recognize the coming changes and equally importantly, the motivation behind them won’t be able to provide what clients want and will lose them to lawyers who can. What are your tips for dealing with informed clients? More information on DIY and cheap and simple here. JD Supra (collection of insights on trends from other lawyers).